Celebrate life's memories with PersonalizedThings by Exposures! 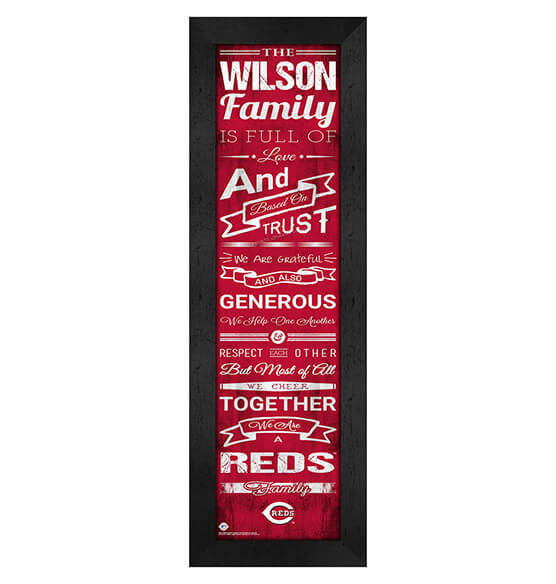 This Cincinnati Reds MLB "Family" Wall Art and home decor is a gift that the die-hard fan of this National League Central division team is guaranteed to love. Our Personalized Family Cheer Cincinnati Reds framed art is easily customized to incorporate both a love for family and a love of this all-American game. Featuring vibrant team colors, the legendary logo and sweet family sayings in vintage-style script, this wall art is ideal for family, friends and co-workers — or a treat for yourself. This piece arrives ready to hang with an included sawtooth hanger.